Monica, a farmer and mother in a remote village in Isiolo county, Kenya, explains how one borehole, a water tank and a group of solar panels have impacted her, her family and her community. CRS and its partners, through the Kenya Resilient Arid Lands Partnership for Integrated Development Program, or Kenya-RAPID, drilled a borehole and then installed the water tank and solar panels, creating a solar pumping system to provide clean water for the community to drink, cook, wash, irrigate land and sustain livestock. 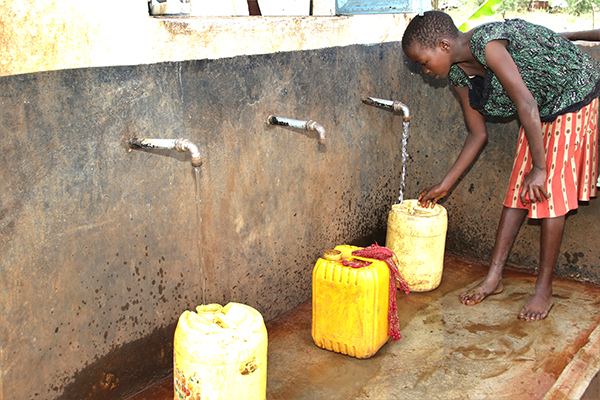 The village now has four water kiosks from which they can access clean water. Instead of walking upwards of 9 miles a day to fetch water, Monica now walks a quarter of a mile to the closest kiosk. She uses the water to bathe her children and send them to school, for her family to drink and use in cooking, and for her farm. Monica proudly shows off her plot of land where she grows onions she can sell at local markets. The water tank and hoses allow Monica and other farmers in her village to irrigate their crops even during the dry season, which seems to get longer and more damaging each year. At the mercy of the sun, rain and unpredictable weather patterns, the men and women in this village work day after day tilling their small farms, hoping to grow enough onions, tomatoes, sweet potatoes and other foods to feed their families. With help from CRS and the Attir water project, supported by USAID, the Swiss Agency for Development and Cooperation, and private donations, Monica and others have been able to increase their harvests and sell produce locally to make extra income. Income that can be used to buy food, pay school fees, buy livestock and extra seed for their farms to diversify and strengthen their income. Another community member, Philip, supports his wife and four children through his tomato plants. He hopes to use his additional income to expand his farm. Each household pays $1 a month for their water supply and can collect 32 gallons of water each day. 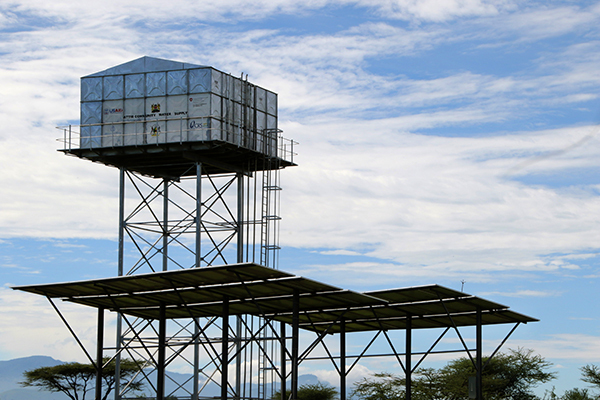 The money is used for the maintenance of the water system in case repairs are needed, ensuring its sustainability once the Kenya RAPID project ends. Mario manages one of the water kiosks in the community. He is thankful for what CRS and the project have provided for him and his village.